North on Miller Avenue in Westlake lies the quiet getaway of Riverside Park. 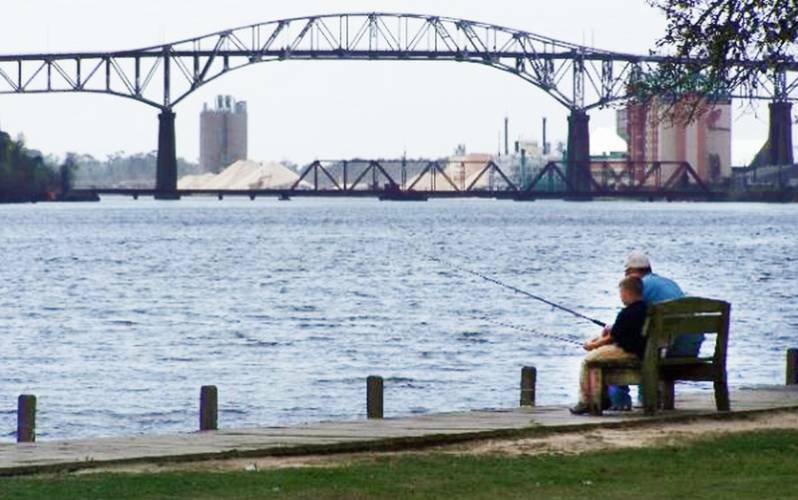 With a scenic view of the historic Calcasieu River Bridge, Riverside offers a great place to go fishing with the family. Also, with its location right on the Calcasieu River, the park offers a great launching point to access Lake Charles. Riverside Park has a public boat launch into the Calcasieu River with access to Lake Charles..
Point of Interest: Lake Charles is accessible from Riverside Park. Once you have launched, make your way south down the Calcasieu River into the lake. Type of access: Canoe / kayak access. Type of fish typically caught near this launch: bluegill, bass, specks, redfish, black drum, gaspergou. For questions regarding parish parks or the availability of a pavilion, please call (337) 721-3540, or email them at sdavid@cppj.net or lcarter@cppj.net. No commercial or fund raising activities are allowed at these buildings. Hours of Operation: Riverside Park is open from 5:00 AM - 11:00 PM daily.